While there are a fair number of professional sports handicappers that focus on NHL betting, for me and many others, it’s the sport we bet on when football and basketball seasons are done. It’s a bit of a shame though, because some good value can be found in hockey, and lots of fun prop bets are available as well. The most popular ways to bet on hockey games are on the money line and puck line, but total (over/under) bets are popular as well. For betting on the winner of the Stanley Cup, futures bets can be made at any online sportsbook, months before the season starts. If you like fun, out of the ordinary bets, the bigger online sportsbooks also offer prop bets for most regular season games. Every online sportsbook offers NHL playoff and Stanley Cup betting, and most of them offer a high volume of prop bets as well. When the NHL playoffs come, more people get interested in betting on games, so the sportsbooks offer more creative types of bets. Since NHL ice hockey is a relatively low scoring sport, no point spread is used. Instead, money line bets are most common, betting straight-up on who will win the game. Favored teams are represented with a negative (-) money line, while underdogs are represented with a positive (+) money line. As mentioned above, negative money lines represent the favored team. The number following the ‘-‘ represents the amount of money that would need to be wagered to win $100 in profit. In the example above, it would require a wager of $135 to win $100 more on the Bruins, for a total payout of $235. In some rare cases when teams are very evenly matched and the game is too close to call, it’s possible for both teams to have negative money lines. When this happens, the odds will typically be -105 for one team, and -115 on the other, or -110 on both teams. Positive money lines work just the opposite. The number following the ‘+’ now represents the amount of money that would be won from a $100 wager. So, in the example above, a $100 bet on the Rangers would result in a $115 profit, for a total payout of $215. San Jose Sharks +150 money line (underdog), or +1.5 (-225) on the puck line (favorite). Colorado Avalanche -170 money line (favorite), or -1.5 (+205) on the puck line (underdog). For Sharks puck line bets to win, they can lose 3-4, because they get an extra 1.5 goals, for a final score of 4.5 – 4. For puck line bets on the Avalanche to win, they need to win the game by 2 or more goals. An Avalanche win of 6 – 4 would be 4.5 – 4. Typically, the team getting 1.5 is going to win the bet, but since the odds are not in their favor, puck line betting can be tricky. Total, or over/under bets, are wagers on the total, combined score of both teams. For example, a game with a final score of 3-2 would have a total of 5. A 5-3 game would have a total of 8. Online sportsbooks set an over/under, based on what they think the total will be. Your job is to decide if that number is too high or too low. If you think it’s too high, then you would want to bet the under. If you think it’s too low, then you would want to bet the over. Many times, you’ll see the over/under set at a half-point, like 5.5. This means that every bet wins or loses, there are no pushes. Most online sportsbooks set their over/under juice at 10%, -110 for either side, but you’ll see variations as well. Sometimes the odds will vary, like O: -115 U: -105 or O: +120 U: -140. The Grand Salami is a prop bet that can be made in several sports, but is most popular in NHL ice hockey. Essentially, it’s a coin flip on the total number of goals every team in the NHL will score on a given day. To place a bet, decide if that number is too high or too low, just like any other over/under wager. Most online sportsbooks give -110 odds, and some give -105. Never pay more than -110 on a Grand Salami bet. Futures bets are wagers made well in advance of the result. For example, you can place bets on the 2012 Stanley Cup champion just days after the 2011 Stanley Cup has ended. In NHL hockey, futures bets can be placed on division, conference, and Stanley Cup Champions. The earlier you place your bets, the wider range of odds you’ll find. Before the season starts, nobody really knows what teams will perform up to expectations, and which ones will not. As the season goes along and the best teams make themselves known, the odds on them go down. So, if you have a dark horse, it’s a good idea to get that bet in early, before the season starts. Which team will score last? Who will score more goals today, road teams or home teams? First team to score 3 goals (or neither). Will player X or player Y score more points? Over/under on single team goals. Will either team score in the first 10 minutes of the game? Will the game go into overtime? During the NHL playoffs, most online sportsbooks ramp up their prop betting options. Of course, there are even more prop bets available during the Stanley Cup Finals. There are a number of ways to bet on the Stanley Cup. First, futures bets can be made well in advance of the series. Futures bets can offer excellent odds if you’re lucky enough to pick the winner. They’re tough to win though, so keep your futures bets small – don’t risk a large portion of your bankroll. For futures bets, we recommend keeping them at a maximum of 2% of your bankroll. If you have a $1000 bankroll, your futures bets should be no larger than $20. Remember, you’re going to have to wait a long time to get paid off on this bet, and that’s only if you’re lucky enough to win. Don’t tie up a large sum on a bet that is likely to lose, and won’t pay off for several months. For individual games, every online sportsbook offers betting for the Stanley Cup. 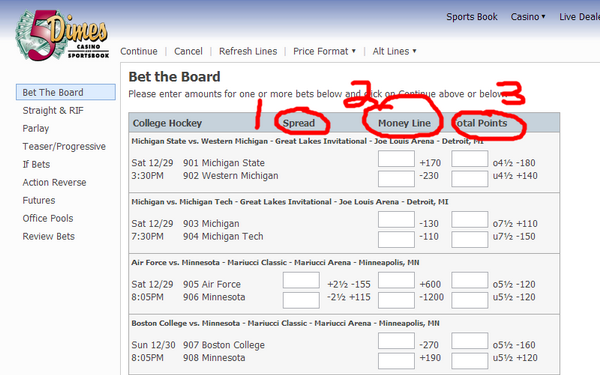 They offer money line, puck line, and over/under bets, along with a lot of prop bets. Each sportsbook is different, but most of them add dozens of prop bets that wouldn’t normally be available in a standard, regular season game. What’s the Best Place to Bet on NHL Games? All round great choice of betting site with an awesome signup bonus. Offer better odds on hockey than most other online betting sites. Best hockey lines and promos available online. NHL ice hockey is the kind of sport you want to be very knowledgeable about. Small team sports like hockey and basketball means that every player is important. If a star player might be sitting tonight, it can make a huge impact on the result of a game. In a sport like football, aside from the quarterback, individual players have a smaller role in the outcome of a game than they do in hockey. So, it’s important to be up to date on injuries & illnesses for key players. Always shop for the best price. Register & deposit at several online sportsbooks, giving you the ability to find the best odds available. Winning handicappers get every little edge they can get, on every game or event they’re betting on. In the long run, these small advantages can be the difference between being a winner or loser. In baseball, it’s all about pitching. In NHL ice hockey, it’s all about goalies – when it comes to betting that is. While other position players have some impact on the odds, the goalies are the key. If the odds look out of whack and you haven’t checked to see who’s behind the net tonight, that’s the first thing to check. Beware of prop bets. A lot of online sportsbooks offer some fun props, but they often take 15-20% juice. Stay away from props with a lot of juice, and never pay more than 10%.